OutreachNC, PineStraw, & The Pilot love LOVE, LOSS…! Thrilled to announce that the sensational KIM COLES is joining the cast of Love, Loss, and What I Wore! KIM COLES is perhaps best known for her ﬁve-season turn as the unforgettable “Synclaire” on FOX’s ground-breaking comedy series, Living Single, Kim Coles has starred on numerous hit television programs including Frasier, Six Feet Under, In Living Color, One on One, and the uproarious TBS comedy series 10 Items Or Less as the villainous “Mercy P. Jones”. She was the co-host of the nationally syndicated daytime talk show, In the Loop with I Village and has been a guest co-host for various shows, including The View and Good Day Live. Kim Coles is also known to reality audiences for having appeared on The Mole, VH1’s Celebrity Fit Club and Coming to the Stage, BET’s search for “the next superstar of funny.” Kim recently became the ﬁrst female primetime game show host in history headlining BET’s inspirational game show Pay It O! In her latest venture, Kim Coles is combining comedy and inspiration to empower others with her unique program called Open the G.I.F.T.S. Through speaking engagements, live events, workshops and products, the program inspires others to discover their own true “gifts” so that they may share them with the world. Kim Coles currently resides in Los Angeles where she spreads love, laughter and inspiration. 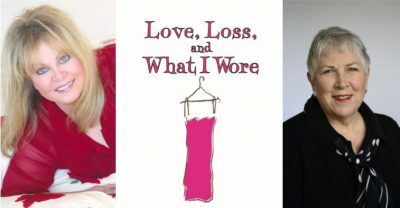 Love, Loss, and What I Wore opens Thursday, October 18 at 7:00 pm and runs through Sunday, October 21 at the Hannah Center Theatre at The O’Neal School (3300 Airport Road, Southern Pines, NC 28387). Thursday, October 18, 2018 at 7:00 p.m.
Friday, October 19, 2018 at 8:00 p.m.
Saturday, October 20, 2018 at 2:00 p.m. and 8:00 p.m.
To purchase tickets online now to Love, Loss, and What I Wore or request additional information, please click here. Tickets will be available to purchase in person at local outlets beginning Tuesday, September 4. Discounted Group Rates (10+) are available online, or email: JudsonTheatre@gmail.com; Discount Student and Military Rush tickets available at the door (limit 2 per ID). 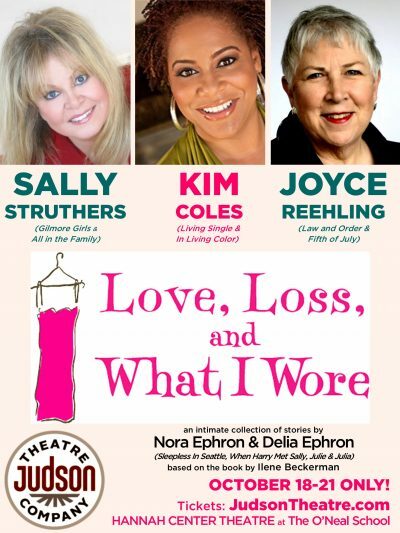 Emmy Award winner Sally Struthers and Broadway, Film & TV favorite Joyce Reehling headline Love, Loss, and What I Wore at Judson Theatre Company (Morgan Sills, Executive Producer and Daniel Haley, Artistic Director). Struthers is perhaps best known for playing Gloria Stivic on the iconic television series All in the Family and Babette Dell on Gilmore Girls. Reehling is a beloved veteran of stage (Fifth of July) and tv (Law & Order). 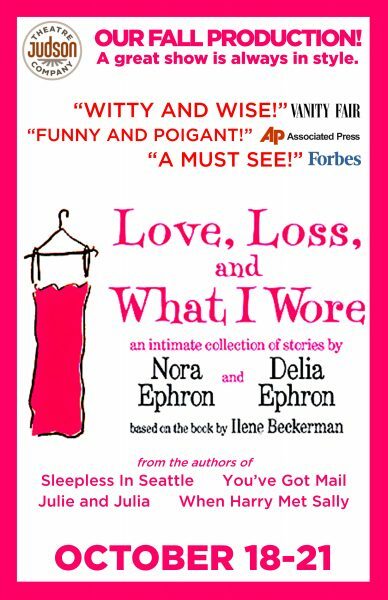 Love, Loss, and What I Wore opens Thursday, October 18 at 7:00 pm and runs through Sunday, October 21 at the Hannah Center Theatre at The O’Neal School (3300 Airport Road, Southern Pines, NC 28387). Additional casting will be announced at a later date. To purchase tickets online now to Love, Loss, and What I Wore or request additional information, please visit https://judsontheatre.com/. Tickets will be available to purchase in person at local outlets beginning Tuesday, September 4. Discounted Group Rates (10+) are available online, or email: JudsonTheatre@gmail.com; Discount Student and Military Rush tickets available at the door (limit 2 per ID). JOYCE REEHLING spent over 30 years in New York working in theatre, television, and film. She appeared in the original casts of Fifth of July and Prelude to a Kiss on Broadway, and off-Broadway in such notable plays as The Miss Firecracker Contest, Reckless, The Hot L Baltimore, Extremities, and The Runner Stumbles. As a member of the prestigious Circle Repertory Company, she originated many roles for playwrights Lanford Wilson, Milan Stitt, David Mamet and others. Joyce worked with Bill Hurt, Christopher Reeve, Richard Thomas, Debra Monk, Swoosie Kurtz, Jeff Daniels, and Cynthia Nixon to name a few. Joyce did many commercials for TV and Radio; she was the first Dr. Mom and was the voice of IKEA on radio. Film credits include Longtime Companion, Lorenzo’s Oil and Roommates. TV shows such as Law & Order, Ed, Kate and Allie, NYPD Blue, The Equalizer, Cosby and numerous daytime dramas were a part of her career. She is a proud member of Actors Equity and SAG-AFTRA. She and her husband now reside in Pinehurst and she writes for The Pilot. NORA EPHRON & DELIA EPHRON (Playwrights) Nora Ephron (1941-2012) was a journalist, novelist, playwright, screenwriter, and director. Her credits include the films Heartburn, When Harry Met Sally, Sleepless in Seattle, You’ve Got Mail, and Julie & Julia. Her Broadway credits include Lucky Guy and Imaginary Friends. Her book I Feel Bad About My Neck: And Other Thoughts on Being a Woman was a number-one best-seller. Delia Ephron is a best-selling author, screenwriter, and playwright. Her movies include The Sisterhood of the Traveling Pants, You’ve Got Mail, Hanging Up (based on her novel), and Michael. She has written novels for adults and teenagers, books of humor, including How to Eat Like a Child, as well as many essays. Her journalism has appeared in The New York Times, O the Oprah Magazine, Vogue, MORE, and The Huffington Post. “After worldwide success, this hilarious and heartwarming play is making its Sandhills debut at JTC, and it’s just what the world needs now…it’s sure to be an audience favorite and we invite everyone to come laugh with us.” states Executive Producer Morgan Sills (Broadway’s Of Mice and Men, Party Face starring Academy Award winner Hayley Mills) “We’ve been saving this play to produce during the Owens Auditorium renovation, in our new temporary home at the Hannah Center Theatre. Sally Struthers, Joyce Reehling, and The Ephrons are an unbeatable entertainment combination.” says JTC’s Artistic Director, Daniel Haley. As Moore County’s only professional theatre, Judson Theatre Company has been bringing the stars to the Sandhills since 2012. JTC is the recipient of the 2016 North Carolina Theatre Conference (NCTC) George A. Parides Professional Theatre Award for Excellence In Professional Theatre for their series of unique productions designed to enrich the cultural fabric of Sandhills and the state of North Carolina. Previous productions include The Sunshine Boys starring two-time Emmy winner Robert Wuhl and tv favorite Don Most; The Miracle Worker starring John James; Agatha Christie’s And Then There Were None starring Alison Arngrim; Twelve Angry Men starring two-time Emmy winner John Wesley Shipp (The Flash); On Golden Pond starring John Davidson; Love Letters starring Hollywood icon Tab Hunter and TV favorite Joyce DeWitt (Three’s Company); Driving Miss Daisy starring four-time Emmy winner Michael Learned (The Waltons); To Kill a Mockingbird starring Johnny Whitaker (Family Affair); and Neil Simon’s Plaza Suite starring Eve Plumb (The Brady Bunch) and Rex Smith (Solid Gold). For more information, visit https://www.judsontheatre.com. The Pilot has posted a photo gallery of The Miracle Worker! Here’s a fun TV interview with John James about The Miracle Worker–JTC always enjoys making the trip to Raleigh for a visit with Caroline Blair! 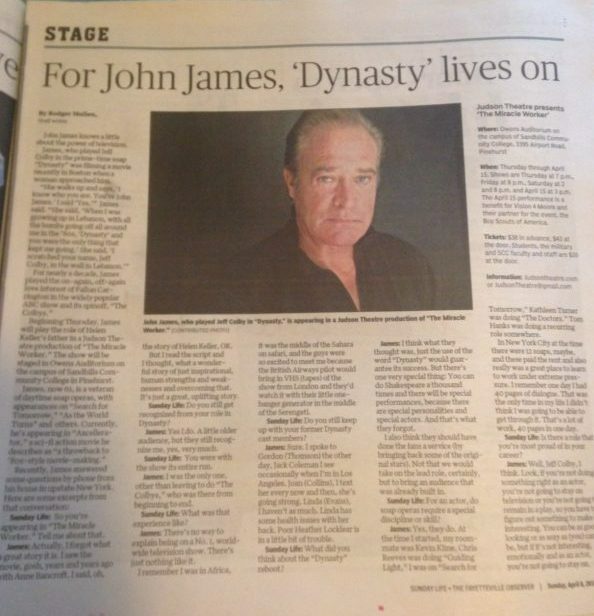 Fayetteville Observer’s MIRACLE WORKER interview w/John James!